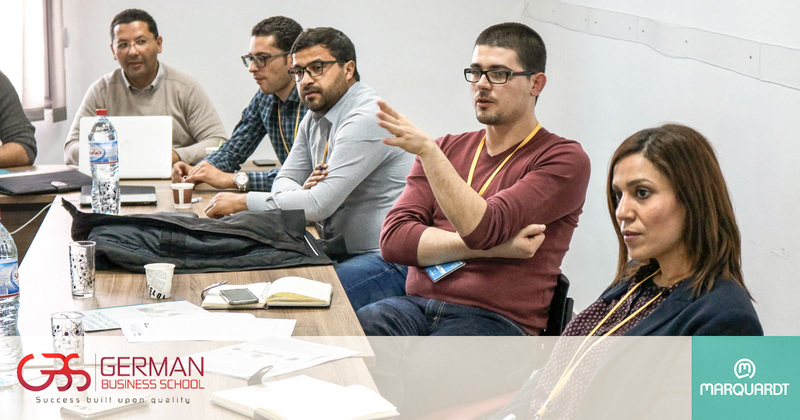 As part of the MBA program that GBS is offering to working professionals and in line with the vision to cope with German standards, the production and operations session was hosted in Marquardt plant in Tunisia for the second successive year. The Marquardt site visit gave the MBA candidates the opportunity to discover different activities and processes handled on site, to have a better understanding of the production techniques. Furthermore, the visit was an excellent opportunity for GBS MBA students to meet production experts and discuss everyday challenges, current trends and efficient production management solutions. The production and operations session '18 was organized as an offsite/in premises format, Professor Naoufel Cheikhrouhou, gave first day lecture in Marquardt premises in a mixed panel of MBA students and Marquardt managers allowing discussion and exchanges between the highly qualified experts of the company and the MBA students. We thank all the participants, especially the Marquardt team, that contributed to the success of the visit.